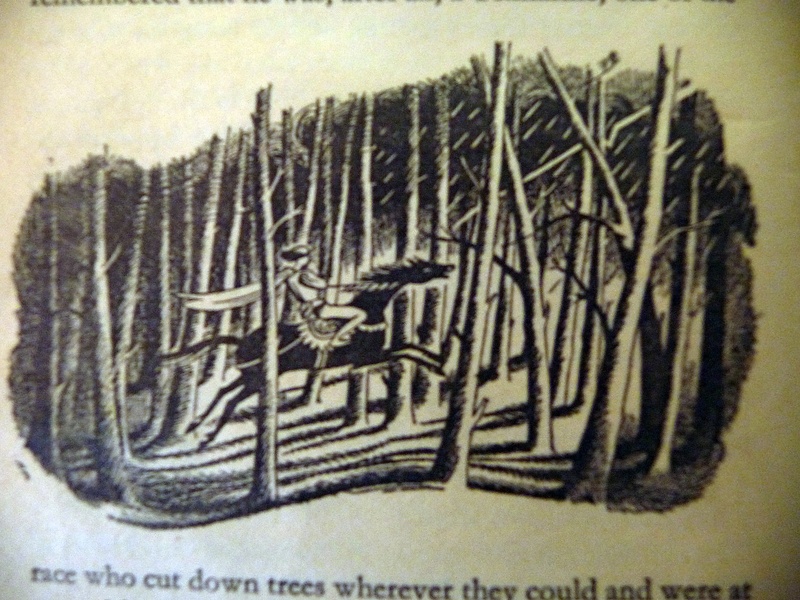 Above, one of my favourite sketches from Prince Caspian by the illustrator of the Narnia Chronicles, Pauline Baynes. I haven’t yet painted my response to the planet Mars, this is because while up north in Ardnamurchan, the trees just didn’t show enough obvious signs of early spring and as I’m heading up there on the 17th May for an exhibition opening, I’ll be able to make sketches and photos of a more spring-like time. Apologies if you’re just tuning in to this blog after a while and don’t know what this is about – this is a continuation of the Planets Series I’m creating this year, which takes inspiration from the planets as understood in Medieval cosmology, and the seven books of Narnia which were each inspired by the seven planets, as described by Michael Ward, author of ‘Planet Narnia’. 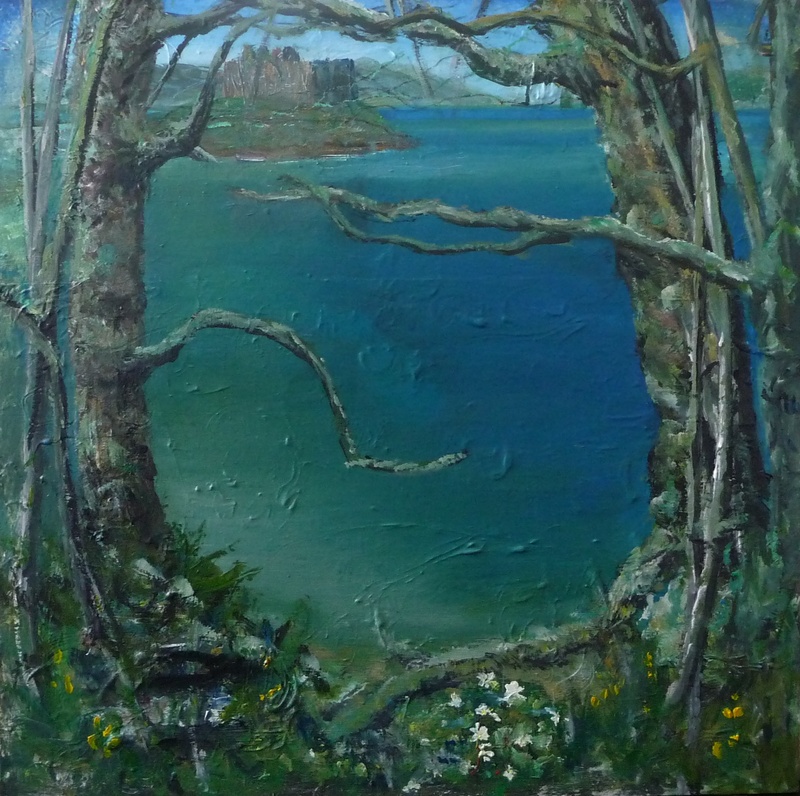 I chose Castle Tioram on the Ardnamurchan peninsula on the west coast of Scotland as the linking back-drop for all the paintings. It’s always seemed Narnia-esque to me, on its sandy peninsula fringed by wild trees, it reminds me of the Castle Cair Paravel, particularly in its ruinous state as described in Prince Caspian ..
As explained by Michael Ward in Planet Narnia, the early association of Mars was growth and trees, since Mars is related to March, therefore spring. In this capacity it’s known as Mars Silvanus – though the more common association with Mars is war. I’ve also been reading books about Medieval philosophy (mostly Agrippa’s Three Books Of Occult Philosophy) and it seems that the influence of Mars is about a certain energy – a vitality or vital force, which I suppose relates to growth and spring therefore presumably fecundity, fertility and sexuality as well as new growth of crops and plants in spring. I’m wondering if the pagan image of the Green Man is related (I haven’t explored that so I’m not sure). It’s the idea of an unleashed unguided energy perhaps, and I’m now thinking of Stravinsky’s ‘Rites of Spring’, which captures the essence of that energy brilliantly. It’s an exciting piece of music, the sinuous sound at the start is very evocative of growing trees, and sensuality, but it has a sort of unsettling violence too as it develops – and that brings us back to the war-like aggressive themes of Mars. 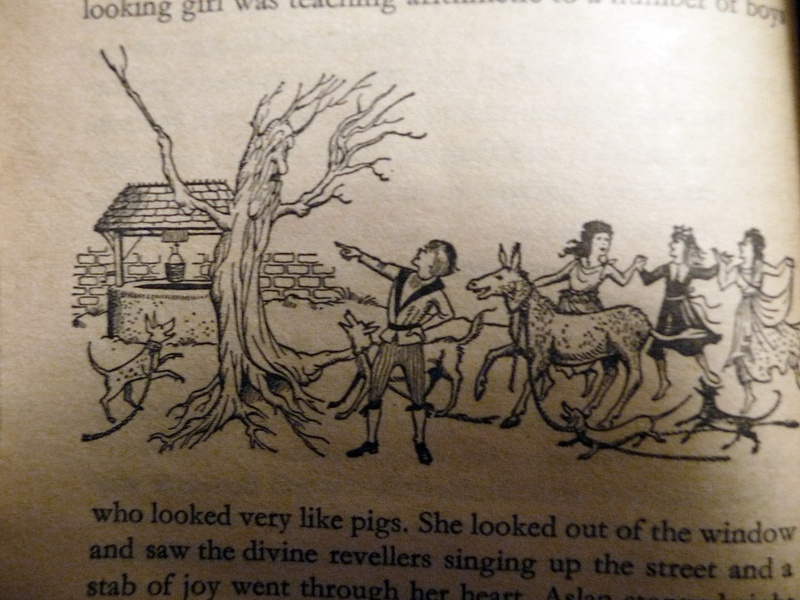 I’ve gone off on a tangent though, and as explained by Michael Ward in Planet Narnia, for C.S. Lewis the influence of Mars could manifest good or bad action, depending on the character of the recipient of that energy. Mars was understood as a ‘malefic’ planet, but in Prince Caspian we see its energy working both ways through the varying characters. In the end though Aslan, and the trees, decide the outcome. C.S. Lewis understood the Mars influence as the essence of courage or fortitude – an iron will (iron is the metal associated with Mars) the ability to keep going despite pain and suffering, also courage in the face of death and destruction. People can use that energy for good or ill, as the characters do in Prince Caspian. The four children arrive in Narnia very suddenly, by magic, whisked from a train platform on their way to school. They find themselves amidst wild trees, and making their way through they emerge on to a beach, and gradually make the discovery that they’re back in Narnia, but that thousands of years have passed and the Castle of Cair Paravel lies in ruins. It’s spine-tingling stuff, one of my favourite passages from the Narnia Chronicles. Lewis’s writing is so evocative and atmospheric, as always. The discovery of an aged golden chess piece – a knight – with one remaining in-laid eye made of ruby is found in the grass amidst the ruins of Cair Paravel. A beautiful and poetic equivalent or image of a knight’s gauntlet being thrown down in challenge. They take on the challenge, realising that Narnia must be re-claimed from the cruel Telamarine usurper, Miraz, and the story unfolds gradually towards the full-blown battle near the end. As they travel back through the wild trees towards the battle-site, they become lost, then after making camp, Lucy wakes during the night believing she hears Aslan’s voice. As she walks through the trees towards the voice, she senses that the trees are almost coming to life again, they stir and seem to dance, then fall still. Later, she does encounter Aslan, who insists that she must wake the others and make them follow though they can’t see him as yet. She expresses her fear that the others won’t believe her or follow (she’s the youngest and tends to be dismissed when it comes to leadership and decisions). Aslan breathes courage into her, and she resolves to convince the others. It’s an obvious depiction of faith, and whether or not you’re religious, it’s a modest, yet affective description of someone discovering faith and resolution against the odds. And on it goes, through the rest of the characters, each resolving to take on increasingly painful challenges, up to the point of battle and death, resulting in victory in the end with the appearance of an entire forest of wakened trees sweeping towards the enemy.. Throughout all of this, there’s much pagan imagery or references to ancient mythologies – Bacchus, Sirenius, Dryads and so on. One of my favourite descriptions is of Aslan, Lucy, Susan, Bacchus and various dryads and naiads helping to free schoolchildren from punishment, or from tedious lessons. Lewis’s humour and compassion (not to mention remembrance of his own deeply unpleasant experience of school) is given full leash here! If you too loathed school, it was an immensely satisfying read as a child I remember. What would I have given to have a bunch of cavorting mythological characters show up and interrupt me being belted, via a dryad causing the headmaster to turn into a tree! Though Prince Caspian is a book about war and suffering, Lewis doesn’t forget to remind us there’s a better way to be, and how poetic, to halt violence through spring trees – the idea of a benevolent influence of mars. There are a few critics of Ward’s thesis that the Narnia Chronicles are each related to the planets as understood in Medieval cosmology, and those critiques have been welcomed by Ward, since they enrich debate. No-one would argue with Lewis’s obvious fascination and understanding of Medieval cosmology and literature – all of his creative writing, including the Planets Trilogy, and many poems explored this theme. I’m not qualified in any academic sense to refute the idea of planets corresponding to the Narniad, I simply know the books extremely well, and so it’s easy for me to immediately conjure up the imagery and ideas that related to the planets as understood in Medieval thought. I’m convinced though, because it seems so self-evident once pointed out. Reading something about Medieval cosmology or understanding the basics at least, is a requirement too, and it was becoming interested in this subject that led to me reading Planet Narnia. So to me the ‘Saturnine’ atmosphere and blackness of The Last Battle, for example, is obvious now – the utter ending, the oppressive feel, deathly law and order, death on its way, and let’s not forget that the four characters are dead, in earthly terms, when they leave Narnia. These are all clearly Saturnine subjects and themes. Not to mention that it’s the 7th book, 7 is the number of the completion of the cycle of time, and Saturn is known as Father Time (who reaches across the sky in the Last Battle and extinguishes the sun). Beyond 7 is 8 – the number of eternity, which is where the characters end up at the end (I’ve just learned about these numbers this moment, having seen a video Michael Ward posted about the symbology of the North Rose window in Notre Dame Cathedral). As I explore these subjects though, I’m also brought face-to-face with the religious themes in Lewis’s work, and the fact that the bulk of academic support for his work come religious organisations or people. This is challenging at times for me, I’m ever wary of organisations and institutions so religious institutions are no exception. (I do not mean to cause offense by these statements – this is about my subjective response). The fact is, that the reason C. S. Lewis’s work and literary output has survived is due to the incredible efforts, sheer depth and breadth of study, not to mention love of Lewis’s work and the man himself, by people such as Walter Hooper and Michael Ward. This isn’t to suggest at all that anyone’s insisting you have to be religious to appreciate C.S. Lewis! (In fact you can find some alarming Youtube videos out there with fundamentalist Christians ranting that Lewis is an evil pagan!) It’s more that in reading about the religious appreciation of Lewis by people who are dedicated (in sane, open-minded and compassionate ways that is) to their religion, I can feel slightly at odds. There’s much about it I don’t ‘get’, the Old Testament and so on. Religious dedication takes a multitude of paths of course, as myriad as the characteristics and varying beliefs of people and their interpretations of religious scripture. I don’t mean to naively or dismissively lump religion into one entity! So I continue to be very vague about my spiritual response to the Narnia Chronicles, not because I don’t feel that aspect powerfully, but because maybe it feels easier not to define it, and perhaps I’m scared of that response being damaged or diluted in some sense. My response to landscape has been coloured and influenced by the Narniad throughout my entire life, from early childhood. 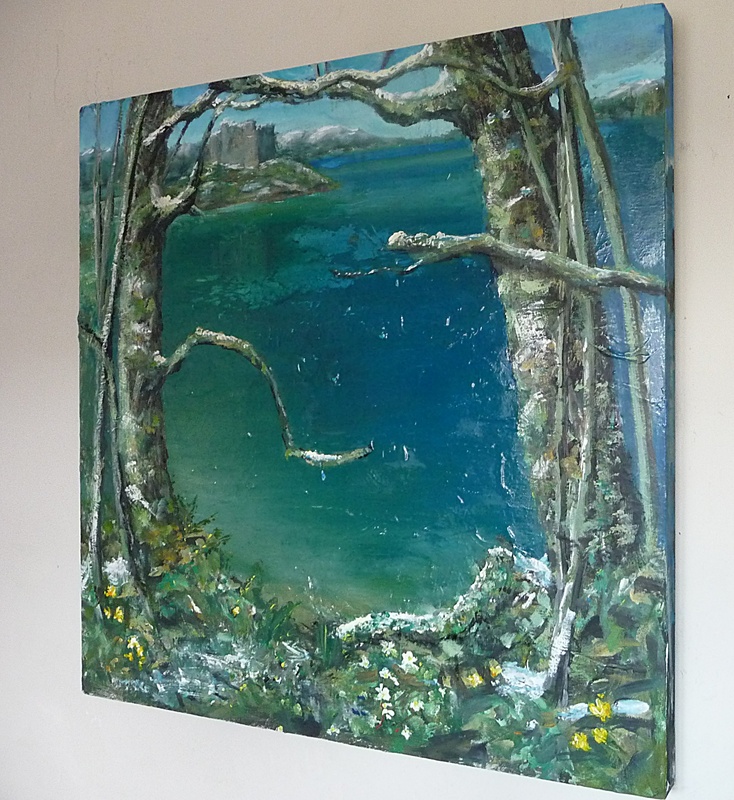 At the age of nine I remember encountering a verdant marshy, mossy area between a small group of silver birch trees – it was a slightly misty morning, with the sun casting a white glow through light cloud. I took my shoes and socks off and felt the grass growing beneath my feet and wondered if I might be transported to the wood between the worlds! Later at the age of twenty I went to the Isle of Iona because I felt the urge to explore my own spirituality. I did discover and experience something, in how I experienced nature there, but there are few people I’d discuss that experience with. If there’s one person I’d have relished the opportunity to do so it would of course be C.S. Lewis! It took me many more years to take up painting landscape, I felt I wasn’t good enough to do justice to what I experienced. 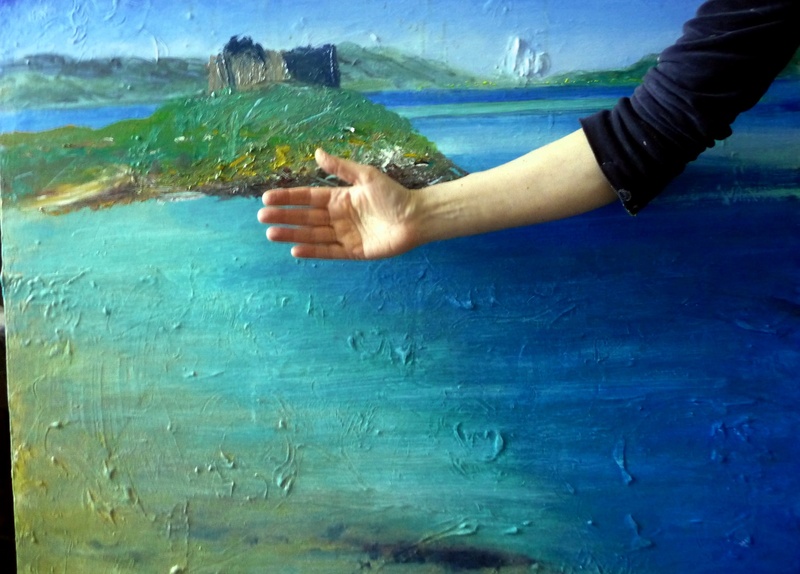 Maybe that’s the same as faith – I remain unclear about faith, but I can paint now without the sense that someone’s standing over my shoulder saying ‘hmph, call yourself an artist? !’, that’s just me saying that these days and I’ve learned to ignore myself in that regard at least! 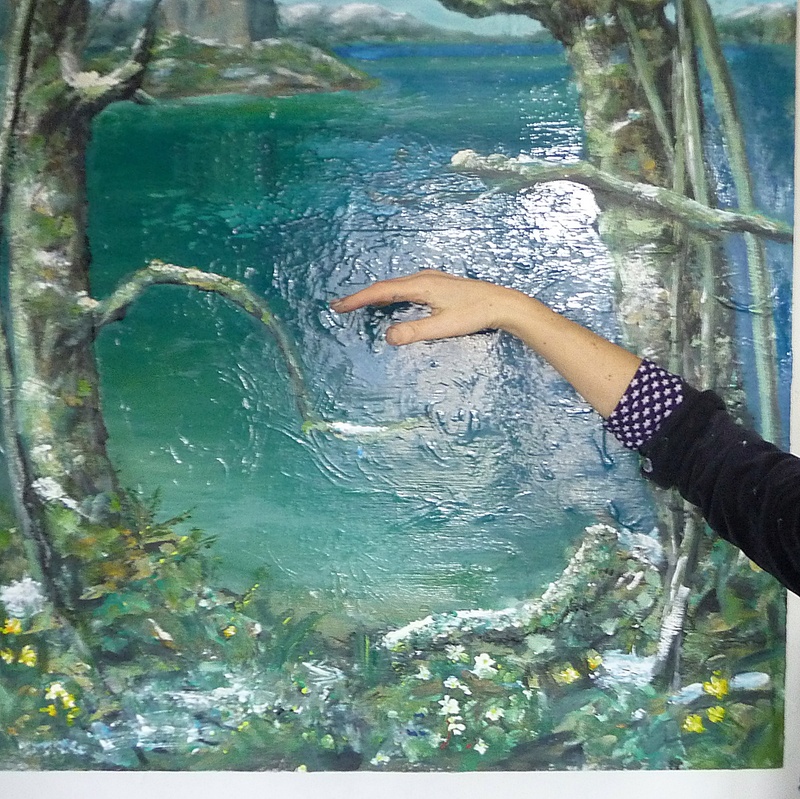 This entry was posted in Uncategorized and tagged medieval planets, narnia paintings, Planet narnia on April 16, 2019 by rosestrang. Above, the first two paintings from the Planets Series which I’m working on throughout 2019. 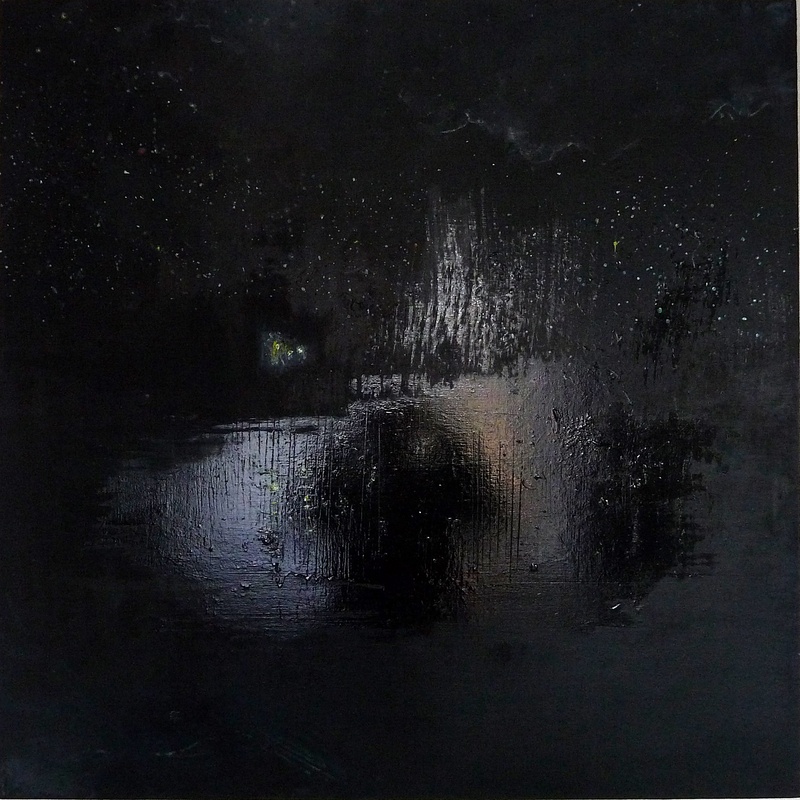 This series of paintings takes inspiration from the planets as understood in Medieval cosmology and mythology, and the seven books of Narnia which were each inspired by the seven planets. All info about inspiration for the series below ..
Until recently, literary critics tended to be slightly dismissive of the Narnia Chronicles. They appear to be a random set of stories, with unruly themes and a vague Christian element that comes to the fore most obviously in The Lion, the Witch and the Wardrobe and The Last Battle. Critics were confused about the structure of the stories; Tolkien (a close friend of Lewis) described them as a ‘hodge-podge’! Yet The Narnia Chronicles are among the most enduringly popular children’s stories of all time (over one hundred million have sold since their publication in the early 1950s). They have broad appeal, not just to children but to adults, also to varying religious groups due to Christian themes (Lewis wrote on theology), and literary academics since Lewis was a scholar and professor of Medieval Classics. The author Michael Ward, one of the world’s leading experts on C.S. Lewis, was completely familiar with Lewis’s work and was the first person (publicly at least) to recognise that the books were inspired by the seven planets. This wasn’t obvious to the average reader (or any reader) since C.S. Lewis deliberately obscured the idea of planets in the books – there is very little mention of planets, sun or moon other than the usual descriptions of light, time of day or night and so on. It took someone dedicated to Lewis’s work to recognise the particular mythologies and qualities of each planet, and to see that each of the books was written ‘under the influence’ of the planets. C.S. Lewis wasn’t being secretive simply to amuse himself, this was more a reflection of his philosophy – he believed that objectivity, or pure reason, stultified imagination and therefore the emotional (or spiritual) influence and atmosphere of a story. He wanted readers to experience the effect of each planet, rather than understand the stories as allegories, or a series of symbols to be recognised by an educated few. 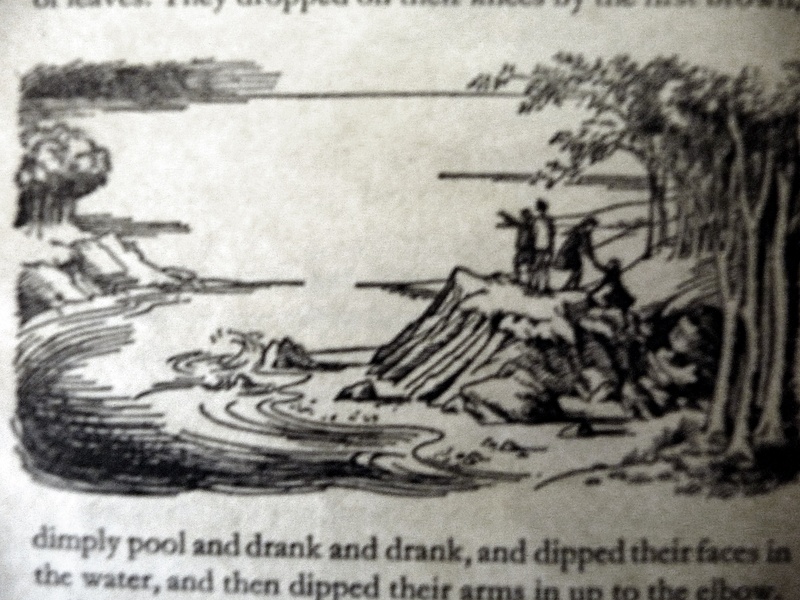 As Michael Ward writes in Planet Narnia, the distinctive atmosphere in Lewis’s fiction was a deliberate and important element of his approach to story-telling. Jupiter (The Lion the Witch and the Wardrobe) Mars (Prince Caspian), Sun (Voyage of the Dawn Treader), Venus (The Magician’s Nephew), Mercury (The Horse and his Boy), Moon (The Silver Chair) and Saturn (The Last Battle). The giant threw his horn into the sea. Then he stretched out one arm – very black it looked, and thousands of miles long – across the sky till his hand reached the Sun. He took the Sun and squeezed it in his hand as you would squeeze an orange. And instantly there was total darkness. Saturn is the planet of endings, death, law, structure, order, liberation or learning following sacrifice, and time (the myth goes that Father Time will be the last person on earth at the end, who will extinguish the sun). Festivals, rituals and feasts have traditionally been held at the winter equinox since ancient times. Christmas adopts the date and corresponds to the themes of death and rebirth associated with Saturn. Every moment the patches of green grew bigger and the patches of snow grew smaller. Every moment more and more of the trees shook off their robes of snow. Soon, wherever you looked, instead of white shapes you saw the dark green of firs or the black prickly branches of bare oaks and beeches and elms. Then the mist turned from white to gold and presently cleared away all together. Shafts of delicious sunlight struck down on to the forest floor and overhead you could see the blue sky through the treetops. In one of Lewis’s ‘Planets’ poems from the 1940’s, he describes the influence of Jupiter as Winter passed, Guilt Forgiven. Jupiter represents the overcoming of Saturn and long winter. Not quite the arrival of spring (associated with Mars) but around February and March the days become noticeably longer and we see the first snowdrops. Jupiter, ruler of Sagittarius and Pisces was seen as the ruler of all the planets. Jove (Roman title) was the name of the ruler of Jupiter, which also relates to Zeus (Greek title) and Thor (Norse), god of thunder, storm and the north wind. Subjects associated with Jupiter were higher learning, theology, the cosmos and the sea. Qualities – joviality (optimism, laughter), honesty, monarchy or kingship. Colours – azure blue, sea green, purple. Animals – horses, dolphins and various others including the mythical centaur. Plants – wood anenome, celandines (among many others). Trees – Oak mainly (associated with Thor, also associated with Jupiter). Day – Thursday. Also … Wardrobes! These were items of furniture which held robes worn by nobles of the court – ‘Ward Robes’ – associated with monarchy and therefore Jupiter. This entry was posted in Uncategorized and tagged C.S. Lewis, medieval cosmology, medieval planets, Narnia Chronicles on February 22, 2019 by rosestrang. The completed painting of ‘Planets Series. Jupiter’. I think it looks suitably Jupiterian and possibly quite Narnian! 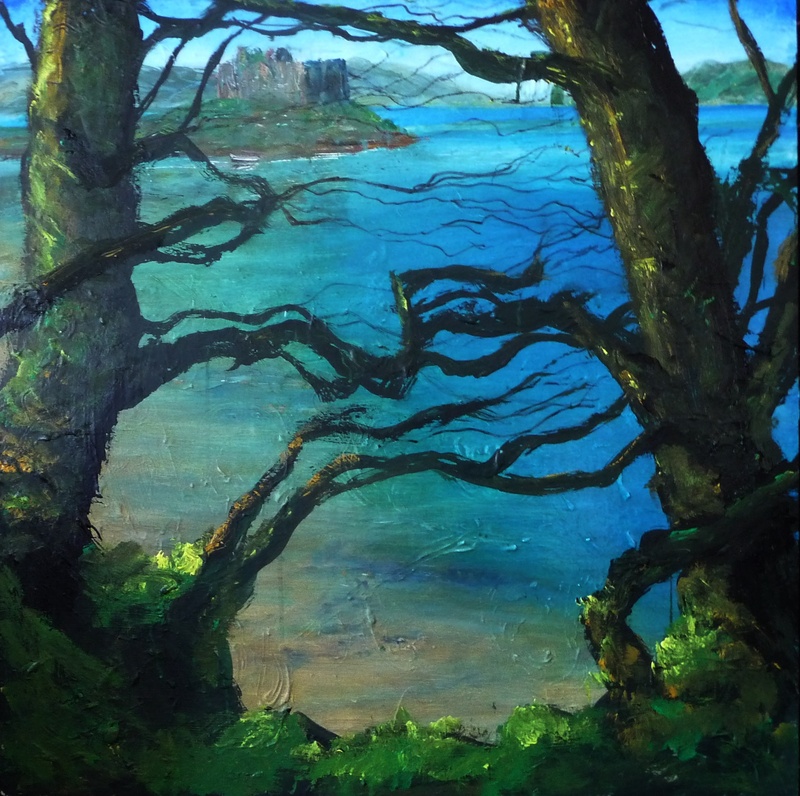 This entry was posted in Uncategorized and tagged Ardamurchan paintings, Castle Tioram paintings, medieval planets, narnia paintings, scottish landscape paintings on February 21, 2019 by rosestrang. Today’s progress on ‘Jupiter’. 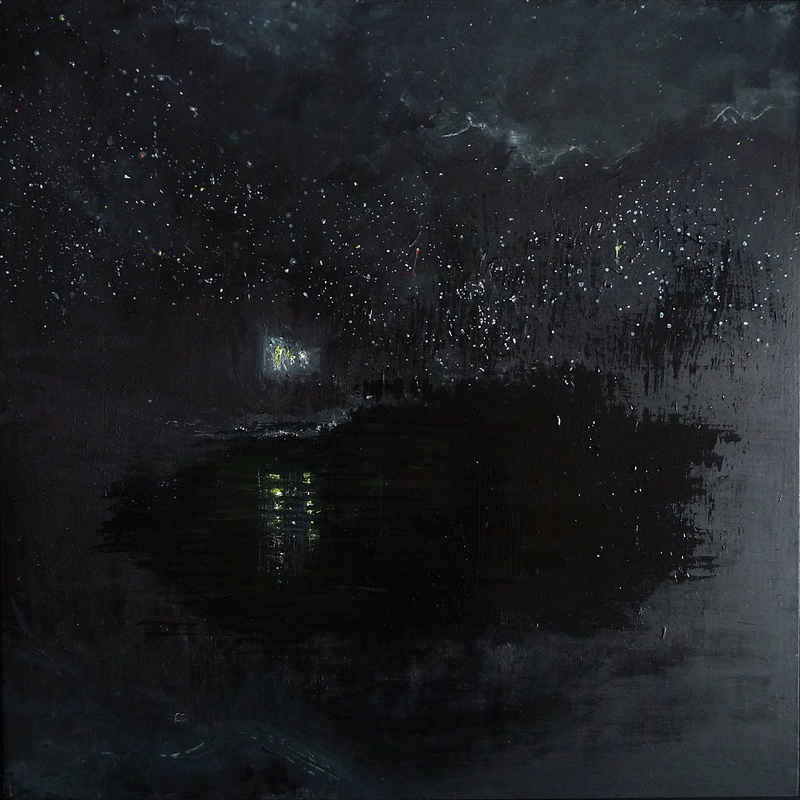 I wanted to create a luminous backdrop for the painting – the sea is a glaze of blues and gloss varnish, which you can see slightly better in this image ..
(This is the second in a series of seven paintings inspired by the seven planets as understood in Medieval cosmology, and the seven books of Narnia, which as the writer Michael Ward discovered, were themselves inspired by the seven planets. 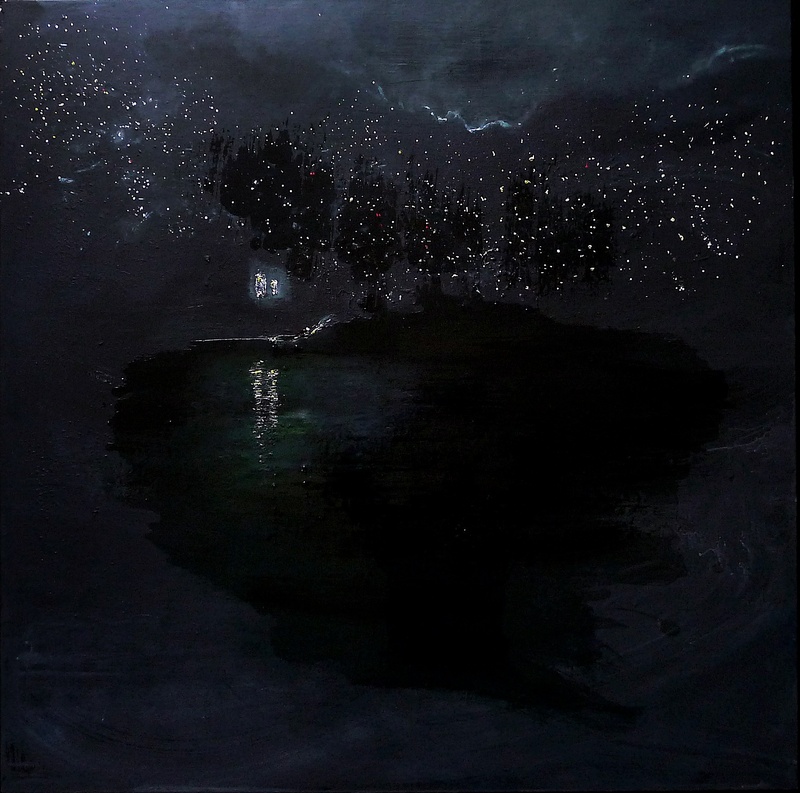 For more about the series, click on ‘Home’, above, and scroll through previous posts). 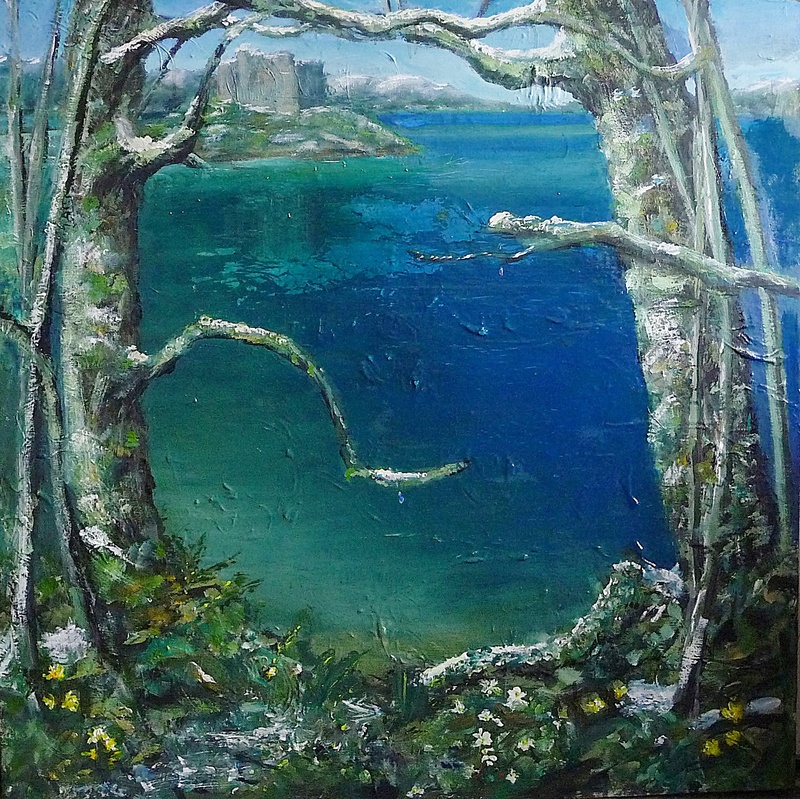 As mentioned in a previous post, I decided to paint Castle Tioram as the theme for ‘Jupiter’. Jupiter rules the months of February and March and I’ll be including trees, flora and fauna related to the planet as the painting progresses. 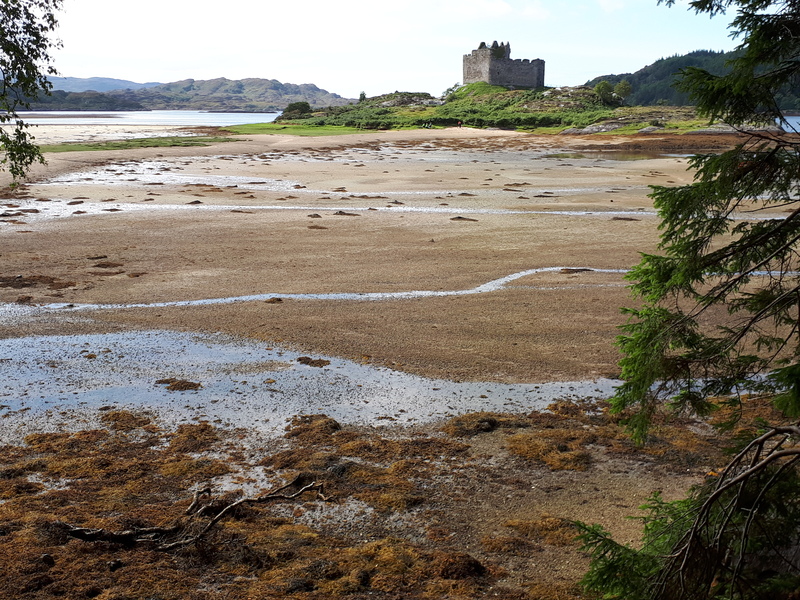 I first visited Castle Tioram (pronounced ‘Cheerum’) in the Ardnamurchan Peninsula in 1992, and returned again for the first time since then in September last year. It was a beautiful, entrancing place back then, and still is. The Ardnamurchan Peninsula is one of Scotland’s most remote and un-spoiled areas of landscape. Ancient forests grow right down to the coast. Mosses, lichens and rare plants flourish in the relatively unpolluted atmosphere – the forest’s ecosystem is more or less untouched, save for a very few pathways and single track roads that weave through the area. So Tolkien wasn’t far wrong, and C.S. Lewis (a close friend of Tolkien for decades) shared this reverence for nature – both author’s books featured the idea of conscious trees. Lewis’s stories featured dryads (tree spirits) able to ‘leave’ the physical tree and travel far distances to communicate important news. (in The Last Battle for example a dryad tells King Rillian that her tree, miles away, is being destroyed along with the rest of the forest). 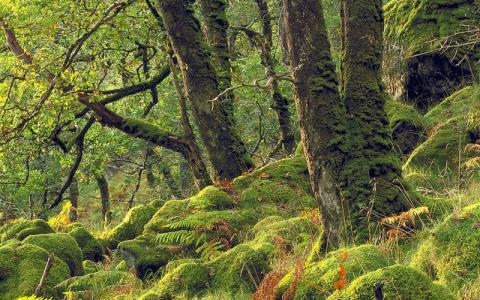 In the east part of Ardnamurchan, further inland, is one of Europe’s rare original oak forests. It’s called Ariundle (derived from Scottish Gaelic Àiridh – meaning a shieling or collection of small huts and Fhionndail – a fair meadow). So, ‘a collection of huts in the fair meadow’. Ariundle is a remnant of the ancient coastal oakwood that formerly stretched along the Atlantic coast from Spain and Portugal to Norway. 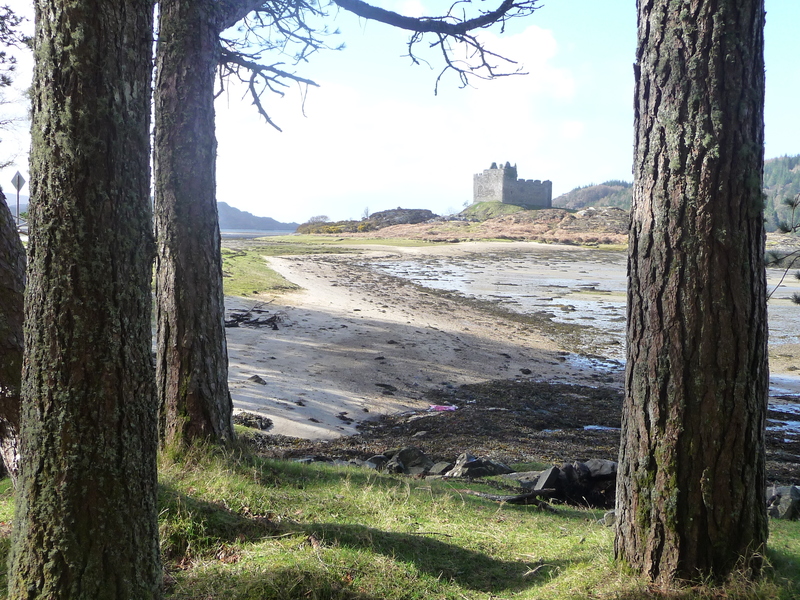 In early medieval times Castle Tioram and Ardnamurchan were far busier places than nowadays. The highways of the ancient world across Scandinavia and the north of Scotland were sea-routes – quicker to navigate than land before modern times when roads were cut through mountains and forests. The north and west of Scotland as a whole was teeming with activity. There were numerous wars of independence and during the Middle ages, Scottish castles were often burned and destroyed during war-times to prevent them being occupied by incoming armies (which is what happened to Castle Tioram). Towards the end of the 18th century (post-Culloden) Highland clearances, then the industrial revolution almost entirely emptied some areas of the west coast. Anyone who hadn’t emigrated, or been forced to emigrate, to America and Canada moved to the cities and towns for work. The one upside of this is that the landscape has been left untouched. 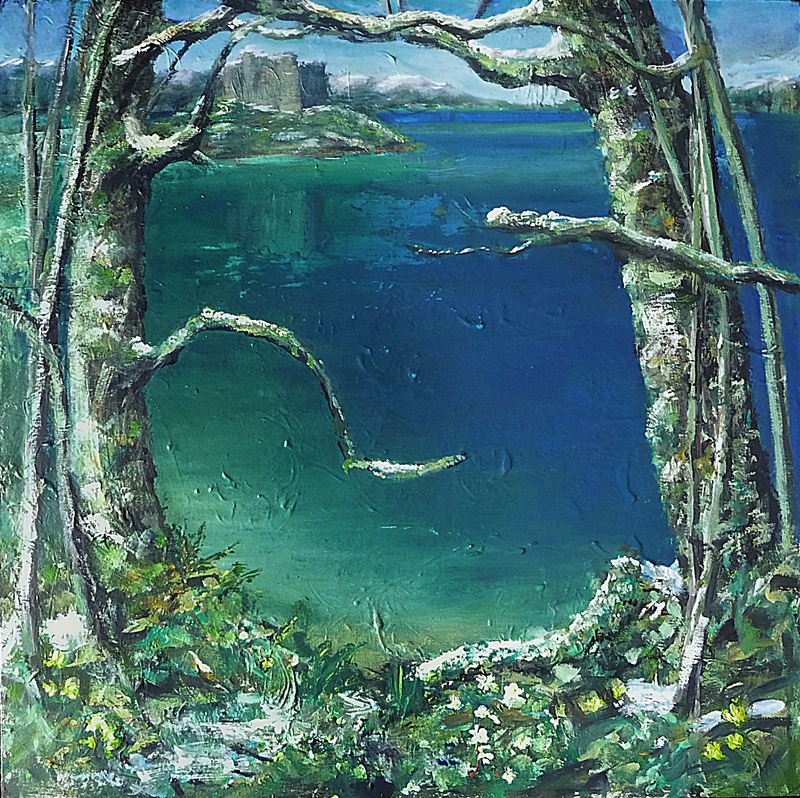 Castle Tioram, situated on a rocky outcrop in a glass-like sea surrounded by wild forest, can have quite an impact on visitors to the place – it does look almost other-worldy, or mythical. Maybe it’s just nostalgia that makes people respond with emotion to the castle, a sentiment or belief that things were better in times past. Looking into early Scottish history though, there are as always two stories – one from ruling leaders, post war, and the story discovered in ancient Gaelic manuscripts. Tioram was never defeated in battle, for hundreds of years it was relatively peaceable (for those times at least, when feuds were common throughout Europe). The castle and surrounding area was home to a large community ruled by the MacDonalds under the complex laws of the early clan system. This society enjoyed thriving art, literary and music traditions, and although the more democratic approach to running society appeared chaotic or ‘barbaric’ to outsiders, it now looks ahead of its time. Men and women inherited title and property, children of the ruling monarchs were often placed in the poorest households of the clan, while poorer children in the community were adopted temporarily by the ruling family. This encouraged connections, the learning of skills, and a balanced community. It wasn’t all peaceable of course, there were the numerous complex feuds between clans, and the wars of independence which occurred between the 13th to 18th centuries. In 1715 the then chief of Clan Donald, Allan MacDonald, torched the castle before joining the battle at Sherriffmuir (1715 Jacobite rebellion – thanks for correction Murdo MacDonald!) He expected to lose, and didn’t want the castle to fall in to government hands. The final battle took place in 1745 at Culloden, and after this the Scottish clan system was destroyed (also due to the fact that many Scottish clan chiefs bought into the new feudal system as it offered unlimited opportunities for wealth and land) and Scotland never regained independence. All of that explains some of the historical reasons why we respond to such places, but maybe our response to castle ruins in a wild remote landscape is also related to the power of fairy tale or archetypes – it ‘speaks’ to us of something important and valuable. In Ardnamurchan the air feels different because it is different – it’s clean, scented with salty brine, sun-warmed wood, mossy forest floors and the honey of heather throughout summer – it feels idyllic. Nowadays we understand the environmental fragility of such places. In an earlier post I described C.S. Lewis’s fascination with Medieval mythology and cosmology – an era in which he believed imagination held an important philosophical role. From a different perspective Jung also explored this area – focusing on the importance of archetypes in the collective human psyche. Early Medieval thinking hadn’t yet lost that sense of universality, and connection to nature. 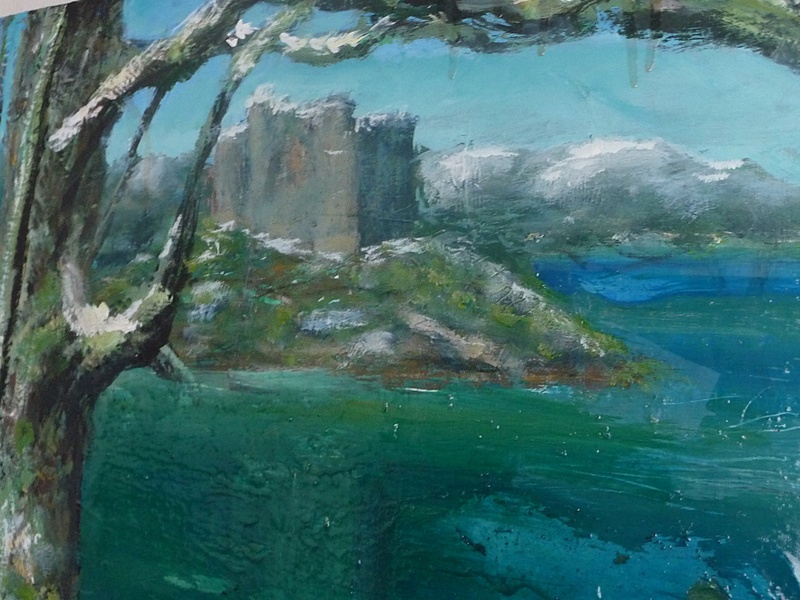 A castle on a remote island reminds us of a thousand different myths and fairy tales – tangled forests, ogres, battles, knights, magicians, princesses plotting escape, not to mention Camelot – a legend based on dreams of a lost golden age and the search for a mysterious holy grail. One conflict of the story is the battle of Pagan and Christian religions – neither of which comes out on top, interestingly. The myth goes (of course!) that both Merlin (Pagan) and Arthur (Christian) will return again. This Gothic or pre-renaissance style of painting is a continuation of Byzantine art. It made way for new ideas of realism in art – perspective and so on – leading to high renaissance art and ‘the age of reason’. Boticelli was sn artistic bridge between these styles and Northern renaissance art sometimes referred back to this earlier era stylistically. All of this is ideal subject matter for my Jupiter painting, relating also to the Jupiterian book from the Narnia Chronicles The Lion the Witch and the Wardrobe which centres on the idea of Winter passed, guilt forgiven – restoration of a golden age of peace in the sea-side castle of Cair Paravel after years of cold and brutality, but this comes after challenges, sacrifice and re-birth (the Christian element of the story – though there are many themes). 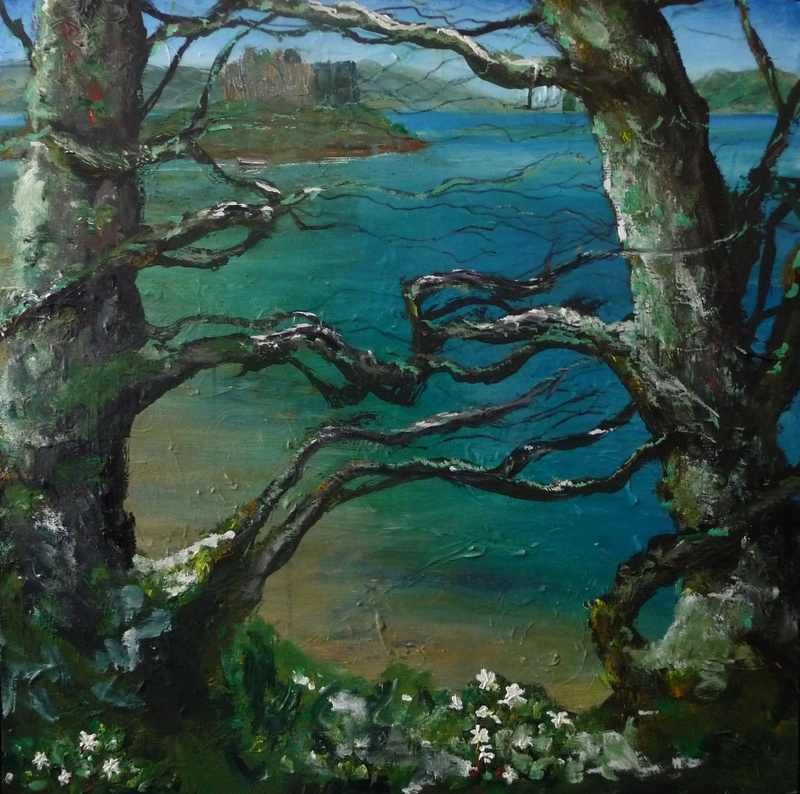 In this story, the dryads and trees of Narnia are still fully alive (in later books they have to be re-awakened) and since the oak is the tree most closely associated with Jupiter, that’s another reason to paint Ardnamurchan, one of the few places where you can enjoy fully living forests. This entry was posted in Uncategorized and tagged C.S. 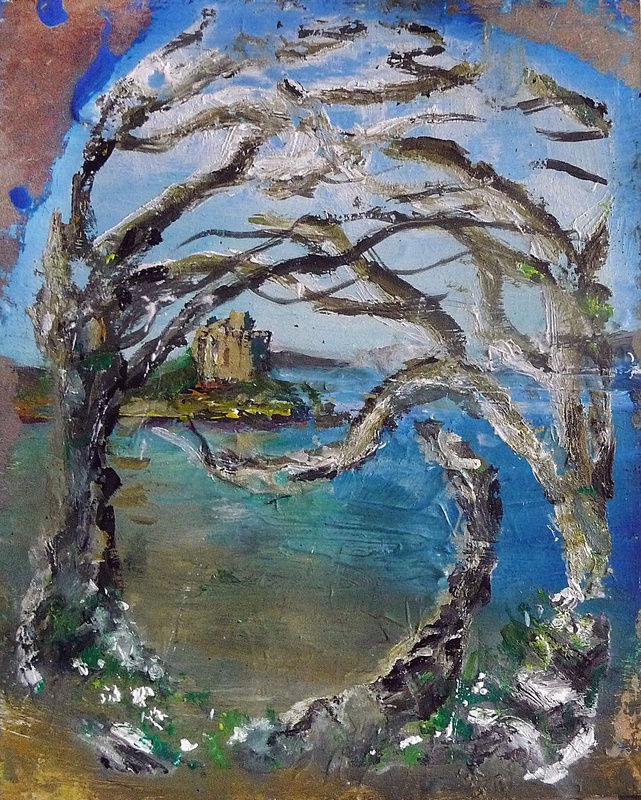 Lewis, Castle Tioram, Jupiter, medieval cosmology, medieval planets, Narnia Chronicles, Narniad, Scottish landscape painting, the MacDonalds on February 15, 2019 by rosestrang. Above, today’s progress on ‘Jupiter’. 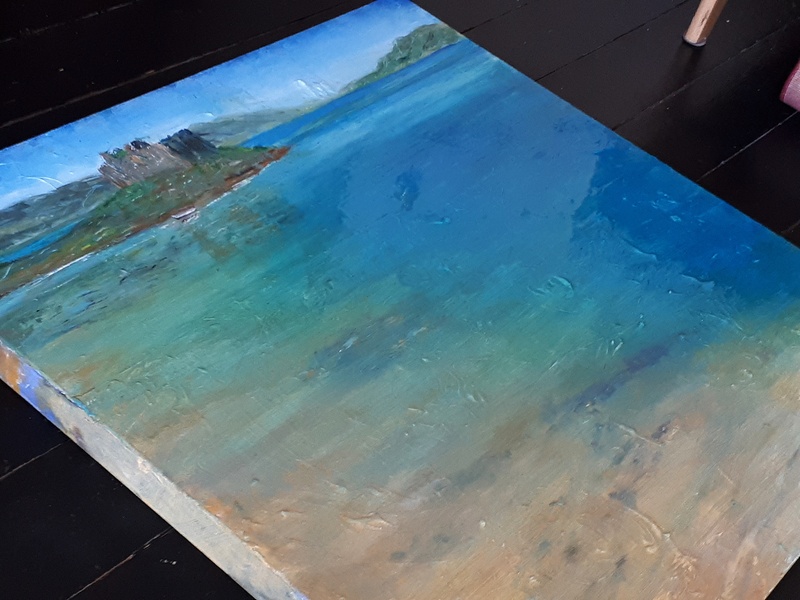 That’s just the background layer, so it looks a bit pantomime-backdrop at the moment, possibly a bit Visit Scotland, but it will look very different within a week. The raised marks are from a previous painting, but since I’ll be painting oak branches these will be incorporated as part of the gnarly texture of tree-bark. I hope there aren’t too many Medievalist experts reading my blog! Reading back over the past posts on this planet series, I need to correct a couple of details. It’s typical of my approach to a subject since I write as I explore, but I’ll get there! 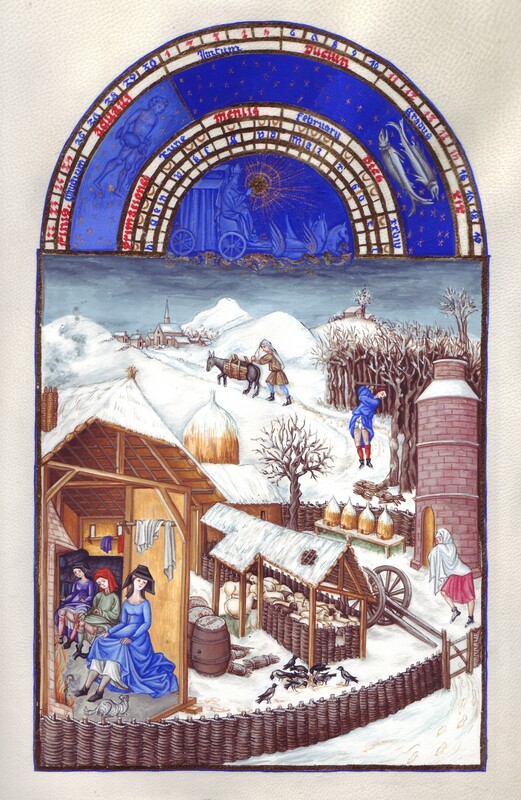 Medieval view of the cosmos in everyday life and in art .. Medieval philosophy, astrology, astronomy, science and religion in the western world all more or less interconnected, though it wouldn’t be described as a rigid or unchanging system of thought and belief. Some religious groups – Gnostics for example, might accept aspects or theories prevalent in the Medieval view of the cosmos, but not others. Similar to any time including our own it would be misleading to say that Western society was ‘of a mind’, to use a Scottish-ism! The Medieval view of the cosmos did feed in to every day life though, it was (as we might say nowadays) fairly mainstream. Ordinary working folks might pray to or invoke a planetary influence. Science of the time included the Medieval understanding of the cosmos, the practice of magic was wide-spread, and included evocation of planetary influence. Writers, musicians and artists would create cosmic and theological allegories, the most famous example probably being Dante’s Inferno. Or more earthy in tone, Chaucer’s character in The Wife of Bath bewails the influence of Mars on her nature – all Chaucer’s stories deal with the influence of the planets, some as entire allegories, woven imaginatively into the narrative so it can be enjoyed as a story, and as inspiration or contemplation. Planetary influence was like a lens of myriad colourful and emotive aspects through which artists could explore and observe the world and human nature. It could be described also as a world of external influence playing on the human psyche (interesting to compare it to the influence of Freud on creativity in modern times – Hitchcock films etc). C.S. Lewis was a Medieval Classics scholar and teacher, who felt that society had lost something magical and profound in the post-Copernican world (i.e. when scientific discovery of space altered our view of the cosmos, and by association a certain way of believing, of faith), and although he spent most of his life writing on Christianity and classical literature, his creative output always dealt with planetary influences. This is why it’s surprising that Michael Ward’s discovery – that the seven books of Narnia were each influenced by the seven Medieval planets – wasn’t recognised sooner. He believes that this had much to do with the fact that most scholars studying the work of Lewis were Christians, so put simply they’d be a bit shifty about the mention of gods in the plural, not to mention astrology. (if you’ve got a strong stomach you can find numerous right-wing Christians of dubious sanity on Youtube declaiming that C.S. Lewis is an evil Pagan.) 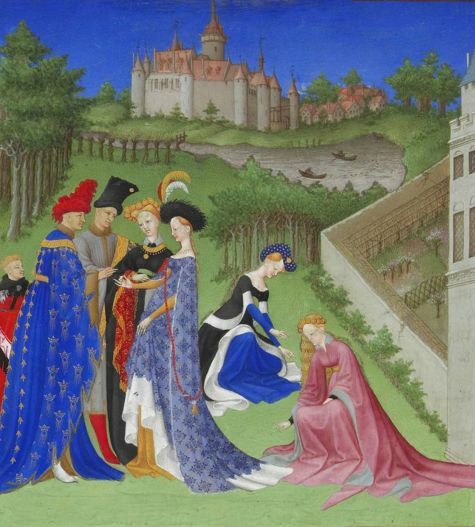 Or, atheist ‘rational’ scholars might dismiss the Medievalist aspects as superstition – they might view the form of romance, or fairy tale as not worthy of serious study – i.e. sci-fi or children’s novels. C.S. Lewis had meaningful or profound reasons for writing in the form of a children’s story. Probably one of the most simple was that it was the only way he could successfully integrate Medieval cosmology in a post-war literary climate where harsh realism was more zeitgeisty. As Ward observes, he opposed the harsh negative, or nihilist, tone of the literature of his time for philosophical reasons. He knew too, that the Medieval view of the cosmos, which in many ways incorporated Pagan approaches to belief, did incorporate the concept of one god. In Medieval thought, there were three layers: Earth, the Celestial Realm and the Empyrean. ‘As above so below’ referred to the idea that earth and everything in it was a reflection of the heavens, but the influence of the heavens could not be experienced directly because everything ‘sub-lunar’ – beneath the moon, was separated from the direct influence of the cosmos. People sought harmony with the planetary influences: ‘as above-so below’, and it was believed their influence could be invoked via ‘talismans’ – objects, plants, animals places etc that related to, or were influenced by a certain planet. Above the earth, the moon drew a sort of veil between the celestial realms and earth. The celestial realms were where the planets resided. The planets, in turn, were influenced by what was termed ‘the divine’ – the realm beyond the planets – the Emypyrean. Going back farther in time, think of the mysterious inscription on the tomb of Isis: I am all that was, all that is, and all that shall ever be, and no man hath lifted the veil from my face. It’s interesting also to explore the mythology of Gnosticism, usually at odds with Christian belief, which has a ‘creation myth’ around the idea of this veil – ‘In Our Time – Gnosticism ). To some branches of thought, the Divine, or the Empyrean, was the unknowable; the One God, ‘all that is’, veiled and beyond human comprehension. In Christian orthodox practice it might be referred to as ‘He’ or ‘our Father’, but the Gnostic view, for example, was that its actual form was unknown and unknowable. A few posts ago, I described how I became interested in Medieval cosmology via exploring Freemasonic symbology. I’ve been amateurishly dipping in to these religious, esoteric or spiritually related subjects since the age of twenty or so, including religious beliefs of the Essenes, Cathars, Rosicrucians and Gnostics among several (I’ve still never felt compelled to actually join a religious or spiritual group though!) I do find a fascinating harmony in Medieval cosmology, and I’m finding this recent research rewarding, I think partly because exploring it helps clarify the interrelated patterns and connections between all these belief systems. The process is made even more rewarding with the added clarity and insight of Michael Ward’s ‘Planet Narnia’. The book doesn’t just explore the planetary influence in the Narnia Chronicles, it also makes sense (to a lay person such as myself) of the experience Lewis is aiming for; he wants the reader to be immersed in these books, in a way that is quite unique. 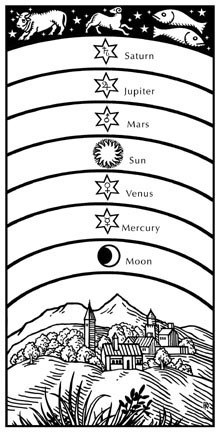 Artists and writers often deal with different layers of meaning in their work, but Lewis’s incorporation of planetary influence went further because it was deliberately hidden – unknowable by the reader even while they experience the influence of the planets as they read. His intention was not just secrecy though, it was intended as a mystical experience – it had to be hidden in order to give that experience and not simply a one-dimensional intellectual understanding. Not only children but adults reading the Narnia Chronicles would be unaware that each was written ‘under the influence’ of each planet – stories, plots and characters woven from an understanding of the mythology and qualities of each planet, with no direct mention of the planets themselves. The poetic effect feels profound while reading the stories, for example the Jupiterian theme of ‘The Lion the Witch and the Wardrobe’; Winter passed and guilt forgiven is (as Michael Ward explains) how Lewis put it when describing the influence of Jupiter in his poem ‘The Planets’. 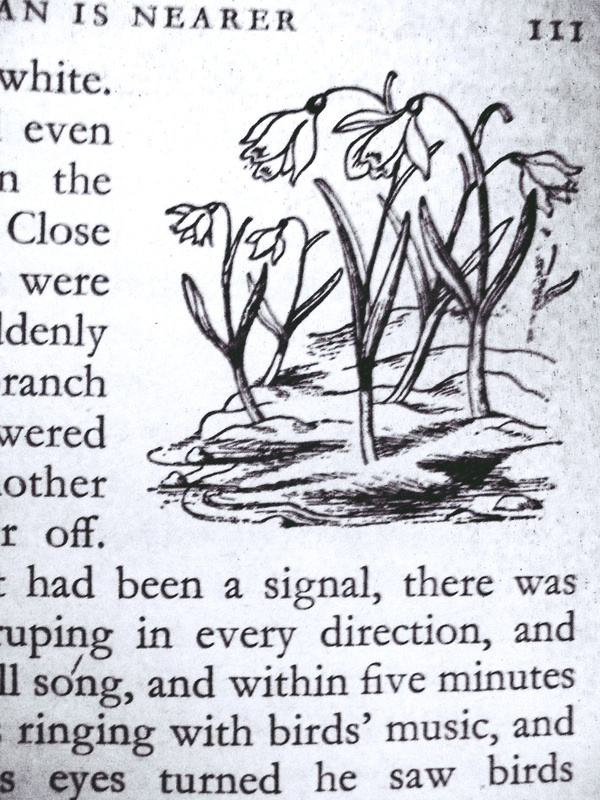 This idea is woven into the pivotal moment in the story when Edmund realises his guilt and regrets his allegiance both towards the witch, and his own selfish motivation – this is described at the same time as the melting snow, appearance of flowers and long-awaited arrival of spring. Lewis had come to question a purely rational approach to understanding faith, and that’s a huge subject to get into and best understood by reading Michael Ward’s, or C.S. Lewis’s books, but something that occurred to me as I was reading this subject was the notion of an initiation – a ritual that’s experienced in, for example, the freemasonic tradition (as mentioned before I do believe that freemasonary organisations have unfair influence, and I question the organisation’s practices, just to be clear!) Part of the esoteric or hidden aspect of freemasonry is the initiation ceremony, which must remain secret because otherwise it’s rational, no longer an experience. And that brings it back to Lewis’s ‘Contemplation and Enjoyment’. The difference between the two is more complex than ‘Subjectivity/Enjoyment’ and ‘Objectivity/Contemplation’. (I mentioned this in the previous post as a way to paraphrase C.S. Lewis’s quote from ‘Meditation in a Toolshed’, but that’s an oversimplification) . Among other things, it’s an acknowledgement of imagination – rationality places us outside an experience, ‘knowing’, Lewis argues, is deeper – it’s all-encompassing, eluding reason, because rational understanding separates us from experiencing, or as C.S. Lewis would say – Enjoyment. I’m not giving these ideas their proper due; better that people read the sources themselves, but to me it offers a deeper appreciation of a more holistic, imaginative understanding and perception, which feeds into my work as an artist. This entry was posted in Uncategorized and tagged C.S. Lewis, Medieval cosmos, medieval planets, Narnia Chronicles, The Lion the Witch and the Wardrobe' on February 13, 2019 by rosestrang. Above – a preliminary rough sketch for the Jupiter painting. I’m sketching ideas for my new painting ‘Jupiter’, second in a series of seven paintings inspired by the seven planets as understood in Medieval cosmology, and the seven books of Narnia, which (as the writer Michael Ward discovered) were themselves inspired by the seven planets. What’s Jupiterian about the painting and excerpt above you may ask! Firstly, the planet associated with the Lion the Witch and the Wardrobe is Jupiter, secondly it’s coming up to the right time of year; in the order of Medieval planets Jupiter comes after Saturn. Saturn is associated with winter, Jupiter represents the overcoming of Saturn and long winter. Not quite the arrival of spring (associated with Mars) but around now the days become longer, we see the first snowdrops, and in the wildest most ancient woodlands the arrival of the beautiful star-like seven-petaled wood anemone (associated with the north wind and Jupiter). Winter is losing its hold at last. 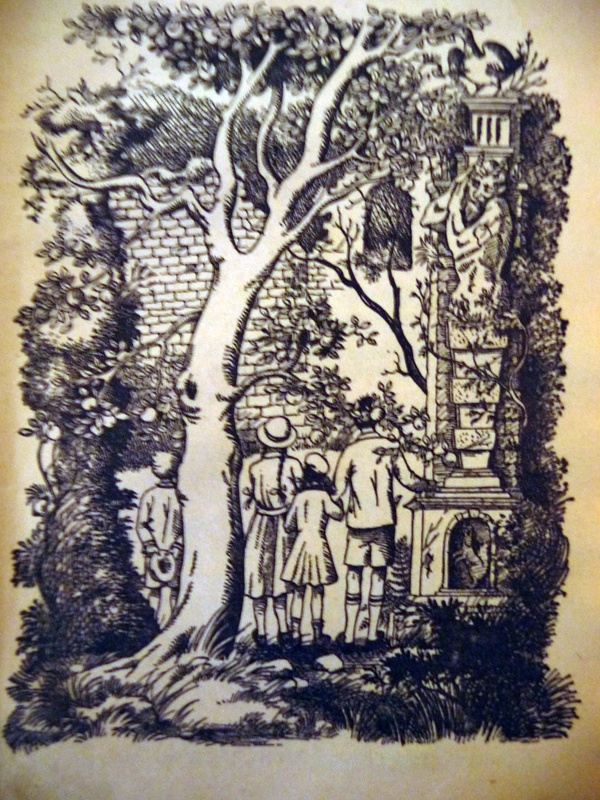 Snowdrop illustration by Pauline Baynes, Narnia Chronicles. Jupiter, ruler of Sagittarius and Pisces (this is the Medieval view of planets, so Neptune, Uranus and Pluto were not viewable at the time) was seen as the ruler of all the planets. Jove (Roman title) also relates to Zeus (Greek title) and Thor, god of thunder, storm and the north wind. Also … wardrobes – you can look it up yourself in Medieval planet associations! ‘The Lion, the Witch and the Wardrobe’. ‘Ward Robes’ – robes worn by kings and members of the court. Fur coats worn by Peter, Susan, Edmund and Lucy discovered in the wardrobe before they enter the land of Narnia through the wardrobe. In the book, Tumnus the faun asks Lucy how she got into Narnia ‘I – I got in through the wardrobe in the spare room’. Tumnus replies – ‘Daughter of Eve from the far land of Spare Oom where eternal summer reigns around the bright city of War Drobe, how would it be if you came and had tea with me?’. All appropriately ‘jovial’ – Lewis was himself a Sagittarian! 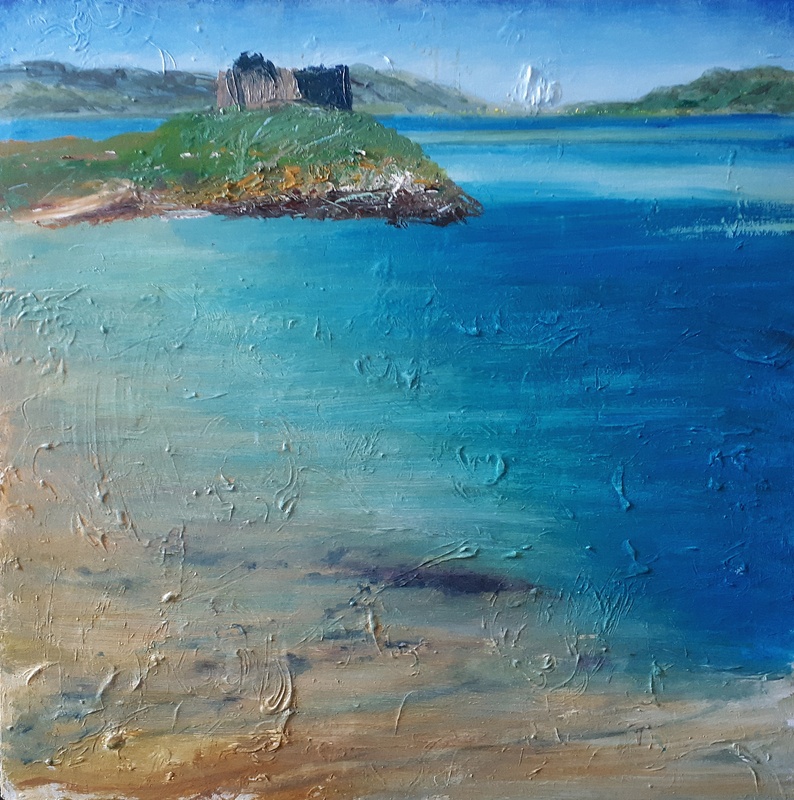 My painting sketch above is a simple, stylised painting of the ruined Castle Tioram in Ardnamaurchan on the west coast of Scotland (which, incidentally is where the Resipole Gallery is situated, which exhibits my paintings). Jupiterian themes in the sketch include oak trees, moss, azure, sea, kingship (castle), some snow, and a suggestion of wood anemones. 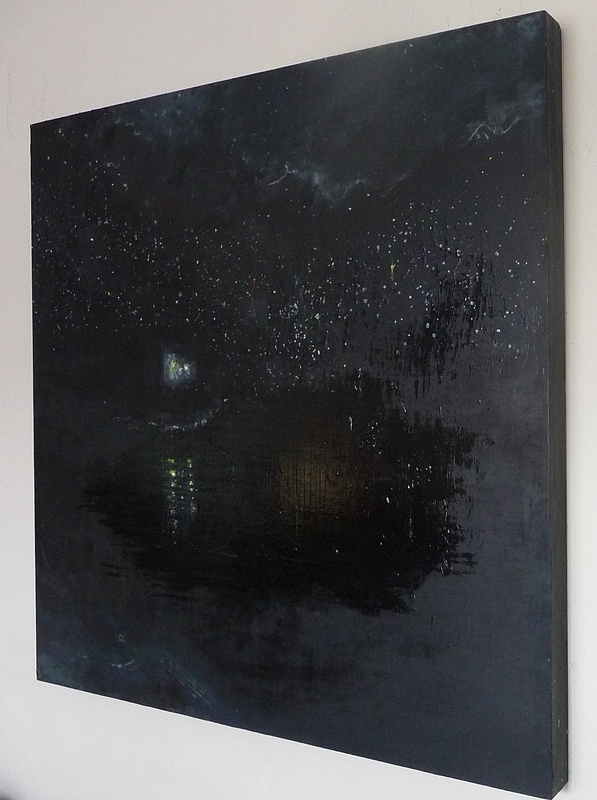 In my previous painting, ‘Saturn’, there’s a reference to the castle there too, but it’s night so you can’t see its form. 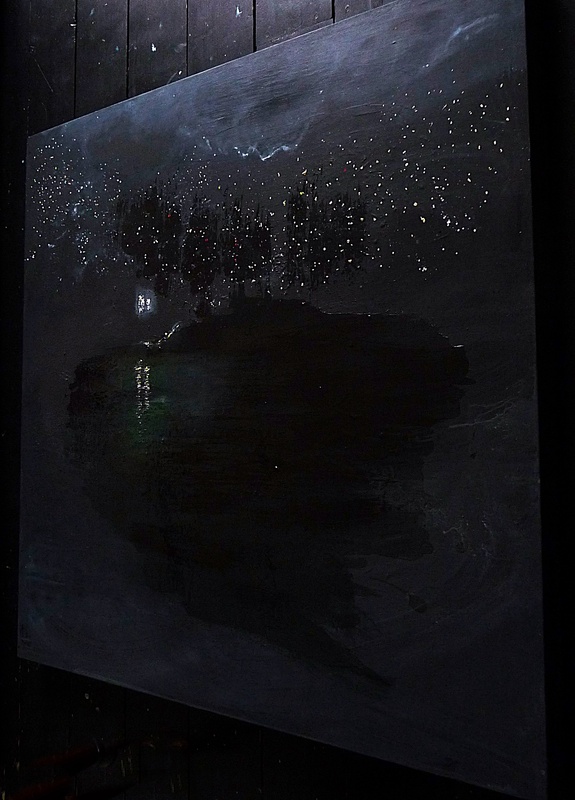 Once I paint the large version of Jupiter, there will be more Jupiterean themes – wood anemones among the snow will be a clear foreground feature, and hopefully I’ll be able to paint the feeling of wind in the treetops (Jupiter ruling wind and thunder). 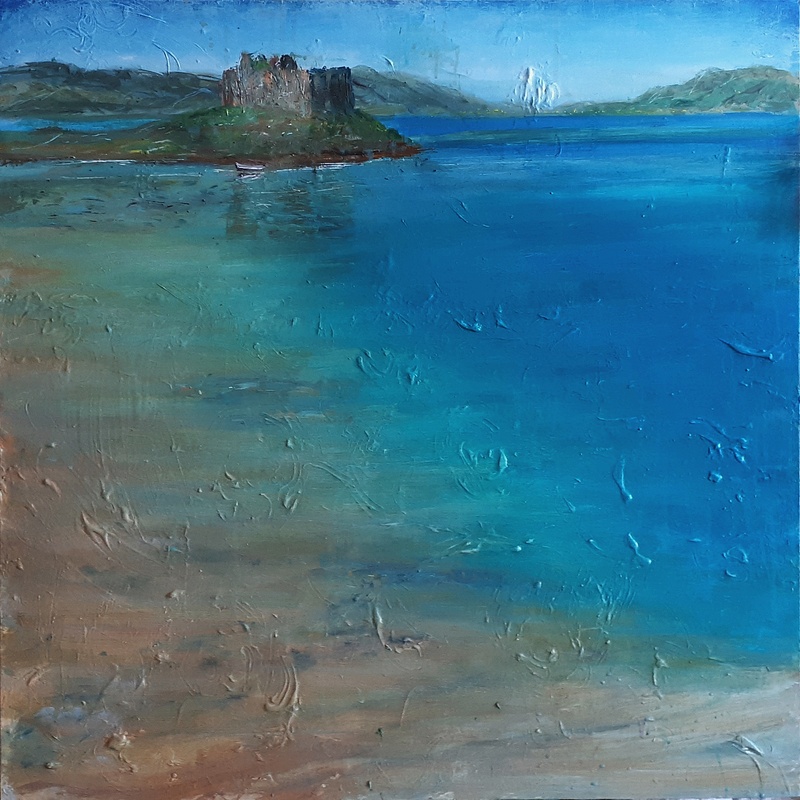 This entry was posted in Uncategorized and tagged ardnamurchan, Castle Tioram, Jupiter, medieval cosmology, medieval planets on February 5, 2019 by rosestrang.